How’s everyone feeling after yesterday’s big “game”? Not much of a game if you ask me…what a blowout! Well, at least we had fun watching it. And now we wake up to the news that there is yet another snow day. It’s falling at a super fast pace and although it looks pretty, I’m just about done with all of this. At this rate the kids will be in school for the Fourth of July. Might be time to whip up another batch of these to “celebrate”…sigh. Preheat oven to 350 degrees. Grease a 11×7 or 9×9 baking pan. Combine first four ingredients. Add milk slowly. Batter should remain a thick consistency. Mix in sprinkles and chips. 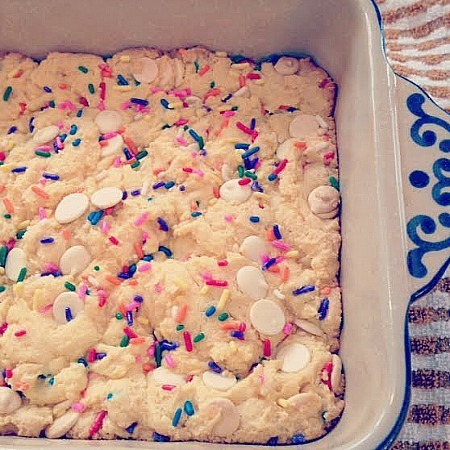 Pour into pan and add more sprinkles on top. Bake for around 25 minutes, until edges are light brown. Let cool for at least 30 minutes before cutting. This entry was posted in bars, chocolate, dessert, QuickAndEasy. Bookmark the permalink.